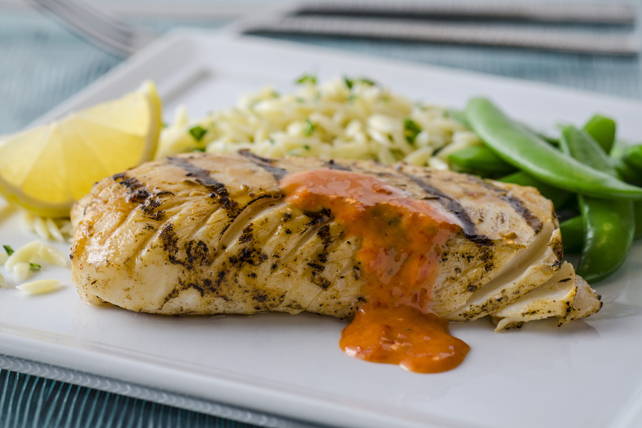 This roasted red pepper sauce is delicious served over the baked fish. But it's equally delicious when served over cooked chicken or if used as a sandwich spread. Blend first 4 ingredients in blender until smooth. Reserve for later use. Brush fish with marinade. Grill 3 to 4 min. on each side or until fish flakes easily with fork. Transfer fish to plates; top with reserved barbecue sauce mixture. Serve with lemon wedges. Serve with steamed fresh sugar snap peas, and/or a side of cooked orzo or long-grain rice.